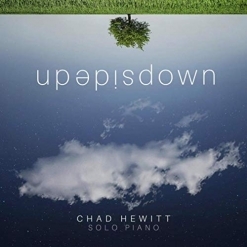 Upside Down is the second album from pianist/composer Chad Hewitt. 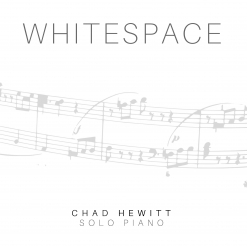 Hewitt’s 2017 debut, Whitespace, was nominated for the Whisperings Solo Piano Radio Album of the Year award, and I’ll be very surprised if Upside Down doesn’t do as well or even better. The album plays very smoothly from beginning to end, making all ten piano solos an excellent enhancement for work, studying or other quiet activities. But don’t let your experience with the music stop there. There is plenty of substance for listening with full attention or, even better, to get lost in while daydreaming, reflecting, relaxing or simply for enjoyment! Hewitt’s faith, his love for people and his love for music come together with warmth and tenderness in his musical expressions. His passion for music started at a young age and he would play as often as he could in any genre and with anybody who wanted to join him. After college, Hewitt started refining his own special ‘sound’ and has more recently settled into composing quiet, contemplative piano solos. Upside Down begins with “Hillside,” a gentle bit of musical sunshine that brings images of bright green rolling hills and a soft breeze making ripples in the grass and wildflowers - a favorite. “Less” tells its story simply with a slightly bittersweet melody and an uncomplicated rolling chord accompaniment. The poignant yet uplifting “Those Who Mourn” seems to be offering hope, encouragement and understanding to anyone who is grieving. “The Meek” is very understated but hauntingly beautiful. “Outsiders” is a bit livelier and more dramatic, but is still quietly and warmly soft-spoken. “Uprooted” is one of the darker pieces on the album and while it is not a song of despair, it seems to be searching for answers. “Peacemakers” moves at a very calming tempo while expressing a kind and straight-forward message of hope and understanding. “Truth” begins at the upper end of the piano keyboard with a gentle, heartfelt melody on the right hand and softly rolling broken chords on the left. It gradually moves down the keyboard, but remains direct and uncluttered. The melody of “Letting Go” is almost conversational and again seems encouraging and supportive. The title track could be referring to a variety of life events or emotions, many of which could be uncomfortable to tragic. The piece feels like it comes from a place of strength and resolve, not confusion or pain; moving forward rather than feeling lost or directionless - perhaps taking on the role of a musical trusted friend! Upside Down is an excellent follow-up to Whitespace, and I look forward to many more recordings from Chad Hewitt. The album is available from www.ChadHewittMusic.com, Amazon, iTunes, CD Baby and many streaming sites.